What used to happen with railway tickets is now the fate of many airline tickets—they are booked and then cancelled as plans change. Cancelling an air ticket is painful; you get very little back due to the penalties imposed by airlines on the cost of exit. With airlines announcing early bird deals, many people book their flight tickets in advance, sometimes even 2-3 months before the date of travel; and some of them have to cancel. The number of cancellations is not that small. 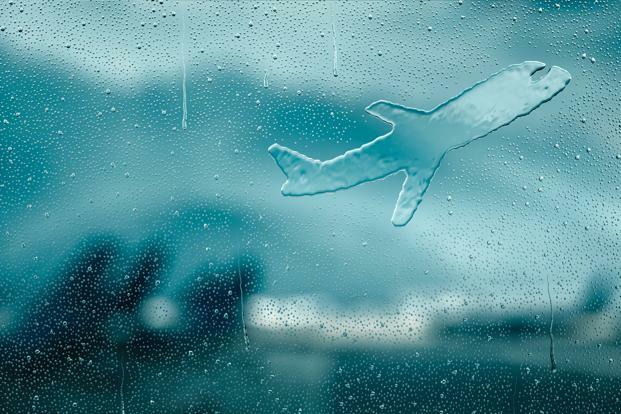 “At MakeMyTrip, on an average about 9% of the total passengers end up cancelling their flight bookings,” said Mohit Gupta, chief operating officer, MakeMyTrip, an online travel company. What hurts the most is when cancellation charges are almost as much as the ticket’s price. The rules say that cancellation charge can’t be more than the basic fare plus fuel surcharge. Plus, the airline has to refund all statutory taxes along with User Development Fees (UDF) and Passenger Service Charges (PSF). It also can’t charge you to process the refund. But what does this mean in actual terms? Consider a one-way ticket from Delhi to Mumbai on Indigo Airlines for 1 April 2018. On 26 March, lowest price was Rs5,396. Of this, Rs3,906 is the regular fare (base fare), Rs 975 is the fuel charge and the remaining Rs515 is for taxes and charges like UDF and PSF. If you cancel two hours before departure, the airline will charge you a fee of Rs3,000 or the base fare plus fuel charge, whichever is lower. So, in this particular case, you will have to pay Rs3,000 as cancellation fee, and the rest will be refunded. Cancellation or change is not allowed within “2 hours” of departure time under Indigo Airlines rules. If a customer does not check in for a flight at least 45 minutes prior to the departure time, the total amount of ticket will be forfeited, except government and airport fees such as PSF, UDF. This means that in case of no show, you will get back just Rs415. If you cancel at the last minute, you lose out on almost the entire ticket price. Most airlines follow similar rules for cancellation. However, there are two ways to bring down these losses. One is by opting for “free” or “zero” cancellation offers, and the other is to buy insurance. Many online travel booking platforms such as MakeMyTrip, Paytm and Goibibo offer this. Terms and conditions vary, and one has to read the rules carefully. “MakeMyTrip (MMT) gives 100% refund of airline penalties, which are close to Rs3,000 (domestic) on an average per passenger in case of refundable flights, and Rs5,000 (same category) on an average for the non-refundable flights. The customer is also entitled to full refund of MMT’s cancellation service fee,” said Gupta. Opting for ‘free’ cancellation is not really free. For instance, at MMT, one has to pay Rs99-549, depending on the ticket’s price. At Paytm, one has to pay Rs199 onwards, and with Goibibo, it starts at Rs149 for select one-way domestic flights. “In case of cancellation, the entire amount paid by a customer is refunded except for the nominal convenience fee and free cancellation fee charged at the time of booking. The final refund amount includes full airline fare, applicable taxes and surcharges,” said Rajan. But there’s fine print. With both MMT, the option is available only on select routes and flights. You can get a complete waiver only if you cancel 24 hours prior to departure. If you just want to change the date of travel, this option is not available. Similarly, Paytm offers to refund the ticket amount on select routes and only if you cancel at least 3 hours before the flight time. 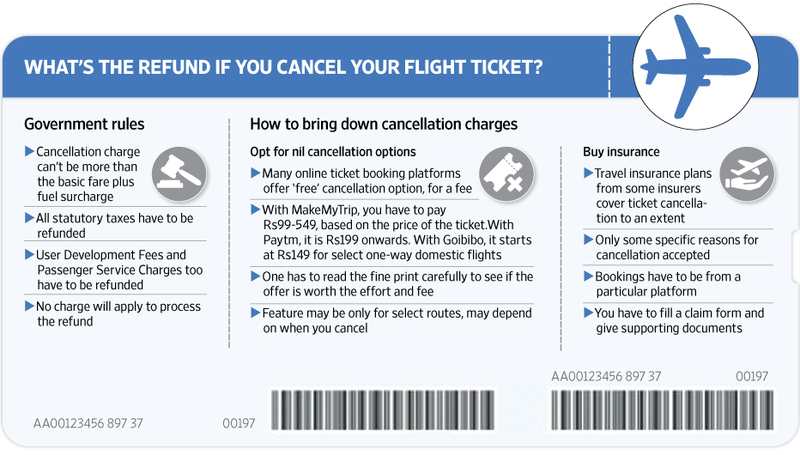 “One out of every eight customers booking a flight on MMT, opts for the zero cancellation feature,” said Gupta. “We have seen 6-10% of all customers booking flight tickets on our platform opt for free cancellation,” said Rajan. In accordance with new Reserve Bank of India guidelines, the refund amount is credited back to the source from which it was initiated. So if you booked using a credit card, refund will be to the same card. The other way to save on cancellation charges is to buy insurance. But, here too, many conditions apply. If you buy a travel insurance plan from insurers such as Bajaj Allianz General Insurance, Apollo Munich Health Insurance, Tata AIG General Insurance, and others, ticket cancellation will be covered to an extent. For instance, Tata AIG’s Domestic Travel Protection Policy, which costs Rs129, covers loss of baggage, medical expenses and also pays the total cost of your bookings if done through Ezeego1 (an online travel company), or up to Rs20,000, whichever is lower. But the reason for cancellation can only be sickness, injury or loss of an immediate family member. Most insurers pay for cancellation of ticket only in specific situations, and there is a limit to which the claim will be settled. You will have to fill a claim form offline and give documents to get the refund. It appears that offers from online travel websites or e-wallets are simpler and faster, compared to buying travel insurance policy. But both have a series of limitations.